This page compares analog signal vs digital signal and describes difference between Analog Signal and Digital Signal types. As we know the signals are categorized into two main types analog signal and digital signal. These signals are used to transmit information from one end to the other through medium. Signal can also be periodic and aperiodic. Analog signal is continuous in nature where as digital signal is discrete. Analog signal can be represented by time varying amplitude such as sine wave as shown. Digital signal can be represented by only one discrete value from finite series of values such as binary signal. The binary signal takes either one or zero to represent digital signal waveform which looks similar to series of square waves. Definition: The continuous waveform whose amplitude changes over time is known as analog signal. The figure-1 depicts analog signals. The signaling technique which uses analog signal is known as analog signaling. 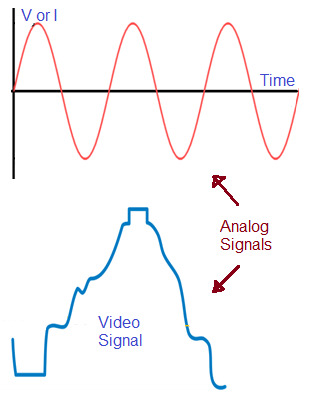 Example of analog signal is sine wave which can not be decomposed any further. The composite analog signal can be decomposed into multiple sine waves. Analog signal is represented by three parameters viz. amplitude, frequency (or time period) and phase. Amplitude indicates maximum height of the signal transition in y-axis. 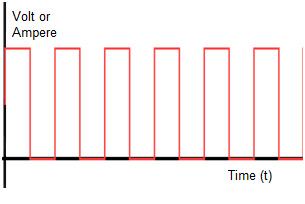 Frequency indicates rate of signal change with respect to time. Frequency is inversely proportional to the time period. Phase indicates position of sine wave with respect to zero time instant or some reference. Analog signals are subjected to interference from noise and hence goes through distortion. This degrades quality of the analog signal. This requires filtering and amplification in order to achieve long distance transmission and reception. The EM (electromagnetic) signal transmitted from antenna is an analog signal. Definition: The discrete waveform which takes discrete finite amplitude values over time is known as digital signal. The figure-2 depicts digital signal. The signaling technique which uses digital signal is known as digital signaling. It is also known as ON-OFF signaling. 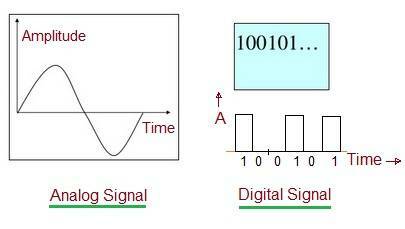 Digital signal can be represented by binary pattern consisting of ones (1's) and zeros (0's). It is also referred by non-continuous signal. Digital signal can also be decomposed into multiple sine waves known as harmonics. The figure-3 depicts analog signal and digital signal. The figure-4 depicts conversion of digital signal into analog signal using DAC (Digital to Analog Converter). Similarly ADC is used to convert analog signal into digital signal. Following table mentions summary of difference between analog signal and digital signal types. It is continuous wave which changes amplitude with respect to time. It is discrete wave which takes discrete values such as binary waveform with respect to time. Represented by sine wave or similar continuous waveform either periodic or aperiodic. Represented by square waves or similar shapes. Three parameters describes analog signal. They are amplitude, frequency (f) or time period (T) and phase (φ). Frequency is inversely proportional to time period (T) i.e. f=1/T. Bit rate/bit interval or data rate or baud rate describes digital signal. It takes continuous range of amplitude values. (Infinite number of possible values). It takes finite set of discrete values e.g. binary (1 and 0). Analog signal is more prone to distortion or noise. Digital signal is less prone to distortion or noise. Output of ADC (Analog to Digital Converter). Analog multimeter functions based on analog voltage or current. It will have pointer indicating output on scale. Digital multimeter functions based on digital voltage or current. It will have numerical output. Conclusion: From the comparison between analog signal and digital signal, we can conclude that each of these signal types have their specific applications such as analog signal is suitable for audio and video transmission as well as EM wave transmission where as digital signal is used for DSP and microcontroller/microprocessor based circuits. Digital signal is used in image processing, telecommunication blocks, data compression and so on.